Are you ready to start blogging about food? Before you get too far into the design of your WordPress blog, make sure you are using a theme that you like. The default theme included in installations of WordPress will work fine for most bloggers, but if you want your food blog to appear original and one-of-a-kind, then search for a theme created specifically for food bloggers. 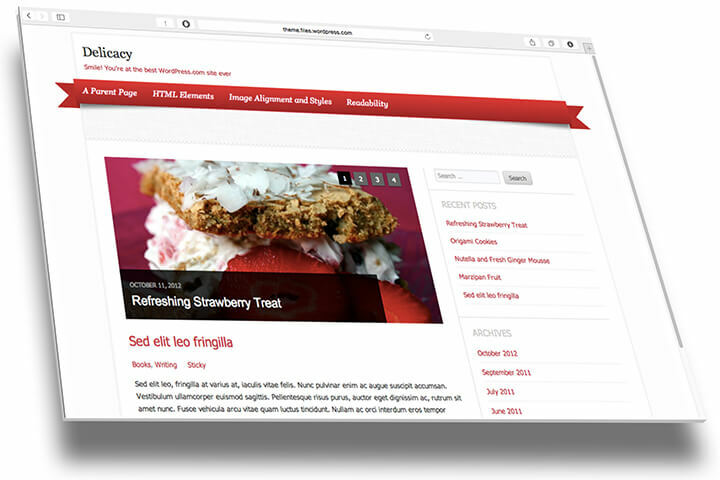 Delicacy is a free WordPress theme that was created for food bloggers and has a very traditional blog layout, with standard sidebar and widget options. Advantages: The main advantages of using Delicacy is that visitors will be used to the structure and layout of your food blog. There is a basic menu along the top and you can choose to use a sidebar along the left or right side of your main content. Overall: Some of the other free themes mentioned in this list have features designed specifically for blogging about food, while Delicacy relies on providing you with a more standard WordPress layout and structure. Confit was actually created for restaurants and cafes, but some of the features included will work well with a food blog as well. The clean design will help the photos of your recipes stand out better. 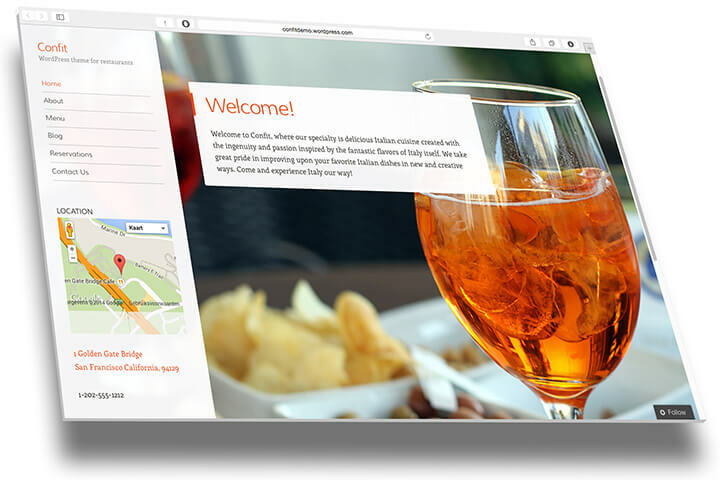 Advantages: Confit is well designed and uses a responsive layout. As mentioned, Confit was originally meant for restaurants, which explains the reservation widget and a spot for adding store hours, but the included food menu feature can be used for adding your own recipes. Overall: Confit is a good solid free WordPress theme; though, you may not find a use for the reservation or store hours widgets. The included customization options will let you change your color scheme and add a custom background. Zylyz has a fun look that should appeal to most food bloggers. The creators have created a free WordPress theme that is light and colorful with several methods of customizing the theme to suit your needs. 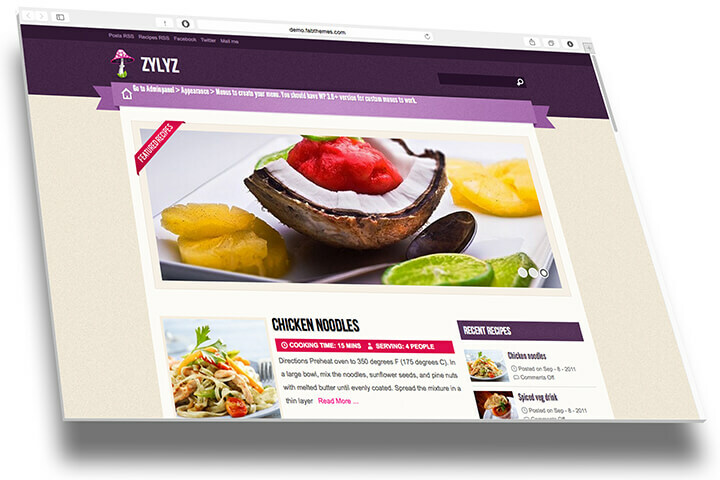 Advantages: Zylyz was made for food bloggers and includes a custom post type for adding recipes. 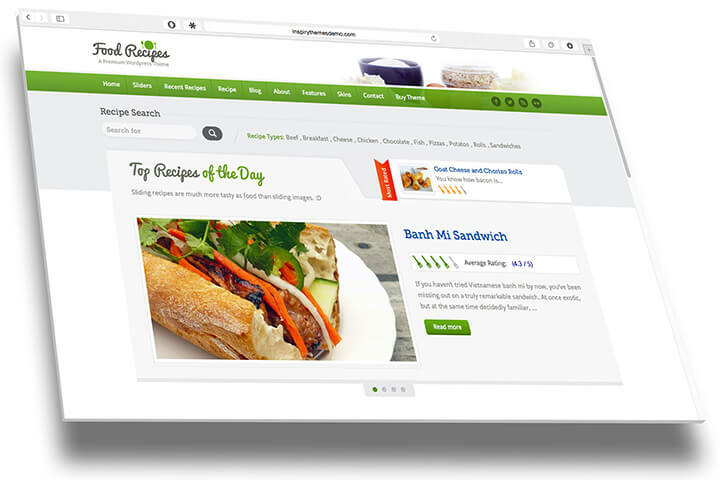 This will display your recipes in a user-friendly manner. To help users out, the creator has included several videos explaining all the features included with Zylyz. Overall: Zylyz is one of the better options for those blogging about food. You should have no problem figuring out the custom recipe post type and adding your own recipes to your food blog. Food Recipes may have one of the most attractive layouts for a food blog, when it comes to using a free WordPress theme. This free theme using the twitter bootstrap for a simple layout that is easy to browse. Advantages: The basic layout of Food Recipes allows your visitors to quickly scroll through your recipes and find the meal that they want to prepare. There is also an included search option, which makes searching for recipes easy as long as you use tags in your recipe posts. Overall: If you are going to be including lots of recipes in your food blog and not adding general posts about cooking, then Food Recipes may be the right theme for you. This is a recipe focused theme, but it does not include a lot of customization choices. 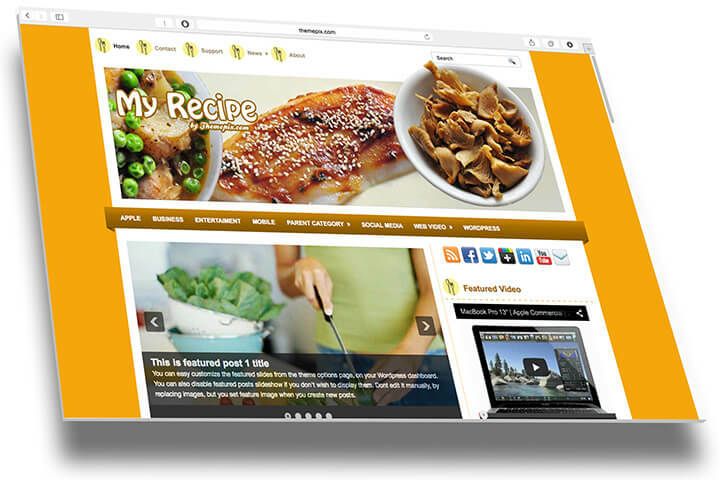 My Recipe is the final free WordPress theme in this list. It has a magazine layout, with a large header image along the top and a homepage slider below the menu. Advantages: When you first check out the My Recipe free WordPress theme, it does not immediately scream food blog, but it does have a solid layout and design. The main feature that makes this a suitable food blog theme is the inclusion of food-related icons and buttons. Overall: My Recipe has a more standard feel that visitors will be familiar with. In the end, My Recipe is one of the more traditional free WordPress themes for food blogging; though, there is plenty of customization features, including custom colors, backgrounds, and menus. WordPress makes it easy to switch themes, but if you want to create a unified look throughout your food blog, it helps to start with the right theme. Take your time exploring your options and install a theme that reflects your overall style. Thank you for looking over this info, if you have a question or comment, drop me a message below and I’ll get back to you shortly. It is strange, but out of these five themes, I can only find one on wordpress.org or in wordpress! Where are they. Only confit is found. Zylyz and others give no result. I too can only find Confit on wordpress. Please assist as I’m interested in Zylyz. You can download the Zylyz theme from the link which will get you a .zip file. Then you can upload the theme in WordPress by clicking the button “Upload theme” instead of selecting one from the gallery. wow these all beautiful themes . I am glad to find this awesome and beautiful free WordPress theme. These themes are really unique and beautiful. I’m looking for a theme for my blog. It’s mainly a food blog, but since I’m an activist as well, I have some news pieces about us up there as well. Kind of strange combo, but thinking my recipe theme may be best. Although I’d love just blog about food, period. Thanks for this info! Are there any paid themes you can recommend, and are they better than the free ones? Definitely imagine that which you said. Your favourite reason appeaed to bee at the web the easiest factor to remember of. I say to you, I definitely get annoyed at the same time as folks consider worries that they plainly do not know about. You managed to hit the nail upon the highest and outlined out the whole thing without having side-effects , other people could take a signal. Will probably bee back to get more. Thanks! Very usefull theme examples, I will use one of them for my recipes and cook blog !!! aas I provide credit and sources back tto your site? here. Please let me know if this ok wijth you. Appreciate it!